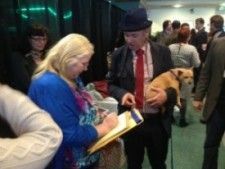 DeAngelo met with a long line of attendees after his speech Thursday morning at the National Marijuana Business Conference. Steve DeAngelo offered a long list of practical business advice Thursday morning at the National Marijuana Business Conference. DeAngelo touched on a wide range of business topics, offering advice on how to advance pro-marijuana politics in non-friendly states as well as how to lure investors. He predicted California to legalize recreational cannabis no later than 2016. He advised business owners to get GPS devices for their vehicles, a functional inventory control system for their shops and good insurance. He advised businesses to step into pro-legalization advocacy roles within their local communities. For business owners in restrictive states, DeAngelo advised owners to seek out political help from advocates on the far right. DeAngelo said the clean image will help accomplish all areas of business growth, from securing real estate deals, to earning operational licenses and attracting investors. The increase in attention from local and national media has also put pressure on the industry to follow the rules. But that’s not a bad thing for business, he believes. Investors, DeAngelo said, not only want to see a clean image from a cannabis business, they also want to see that a business owner has laid out a clear strategy for the stages of business growth. The growth the industry has experienced is not going to slow down, DeAngelo cautioned, so business owners should prepare themselves for sudden shifts in the market caused by new legislation and technological shifts. DeAngelo believes the infused products offers the best market for innovation and growth, alongside smoking paraphernalia such as portable vaporizers. But the new technology and legislation puts a premium on specialization within the industry.